Filip "Drirr" Appl comes from Pardubice, the Czech Republic, and has been involved in larp for 15 years. He has written and run many indoor and outdoor larps. He is a freelance journalist, improvisational theatre actor and teacher, and a co-organiser of Gamecon, a festival of analog games. 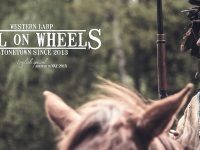 The Hell on Wheels larp is a dramatic game for 54 players that takes place in Stonetown, a western settlement in the Czech Republic.